While Summit has a strong approach to developing learning and critical thinking in the classroom, the students lack any form of physical education. 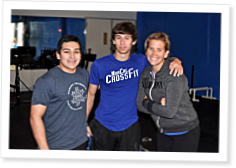 After experiencing for himself the physical and mental benefits of CrossFit, Loera built up the courage to approach his school administration at Summit Tahoma in San Jose, Calif., to make a change. Loera spent countless hours developing detailed proposals to convince the administration to approve an after-school CrossFit program. He won his battle, but the financial burden of providing equipment and coaches required some help from the CrossFit community. On Sept. 14, CrossFit Poipu hosted a trail-run fundraiser to sponsor local youth into the gym’s CrossFit Kids program. Cool story and great work Nick. Sounds like you're a good leader and you're starting a great thing. At the Champions Club, our entire coaching staff is teenagers. If you need any experience pointers, hit us up! Embrace the mistakes you make, they will just make you better in the long run.